You have worked hard to get those customers calling and emailing you about catering services, show them some professionalism and assure them you know what you are doing. 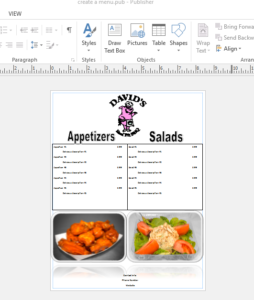 Here I will be dissecting the three main parts of this catering order form template. Obviously, you will want to include some basic contact information on the catering order form. Setting up your form this way will be not only useful to you but your staff as well. It will help training them and even allow them to take orders when they might not be 100% familiar with your entire catering menu. The first thing you will want to ask is their name. People like to hear their name so make sure your write this down instantly and make sure to call them by it as you walk through the order process. You will also want to note if they are calling from a business. This is important as you grow your database so you can continuously send marketing messages to them. However, business may have monthly or even weekly meetings, summer picnics, holiday parties, etc. So you will want to add them to your database to try and get them to order more frequently. The next question that should definitely be on your catering order form is ‘have you order from us before?’ The reason goes back to your appearance of professionalism. How does it look when a customer has to give you your address every time they call you to place an order? As you build your database this will not be an issue. However, when you are first starting out you may have to ask them one more time (since you didn’t have a database last time) but should never have to ask again. We use RCS Catering Software to manage our database as well as process the catering orders, but you could just as easily use Microsoft Excel. Either way, if they have answered yes to ordering previously you don’t need to ask them for any more contact information. If they are new customer (you should now make sure you sound appreciative for their business) you will need to get all of their contact information. Now that you have all the contact information you need you can begin to talk about the order details. As you can see on this template, I have a few details regarding the order but it is mainly blank lines to write in what they want. The reason I didn’t list out every menu option was that one, it wouldn’t fit! If you have a simple menu with just a handful of options you may want to consider including them on your catering order form. The other reason is that we sell a lot of custom menus so we found we weren’t really using the pre-printed items as much anyway. For the actual menu just give yourself plenty of space to write notes about the order. Our catering sales staff love these order forms! It makes it easy to deal with the customer and walks them through the entire order taking process. On the bottom of the page you will see two little lines that we added. These are to remind your employees to SELL! As I have mentioned in other posts, it doesn’t matter how good your food is, if you don’t go out and sell it you will never reach your full potential. After you feel like you have discussed all of the order details you need with the customer, that ‘Extras’ line is there to remind you that you are not done! They won’t always say yes but they will sometimes and if they don’t, well at least you asked. Just by asking that question you could add $30-50 to an order. Two or three of those out of every 10 will add up over the course of a year! Depending on how you menu is structured there could be a number of upsell items listed here. The last line “Smile, they can tell!” is to remind your staff to smile! You can really tell on the other end if the person you are talking to is a in a good mood and this will help ensure they are. Winning over your customer on the phone is almost as important as delivering on the food. You want the overall customer experience to be awesome. So project some enthusiasm in your voice when you are taking orders. After all they are paying your bills! 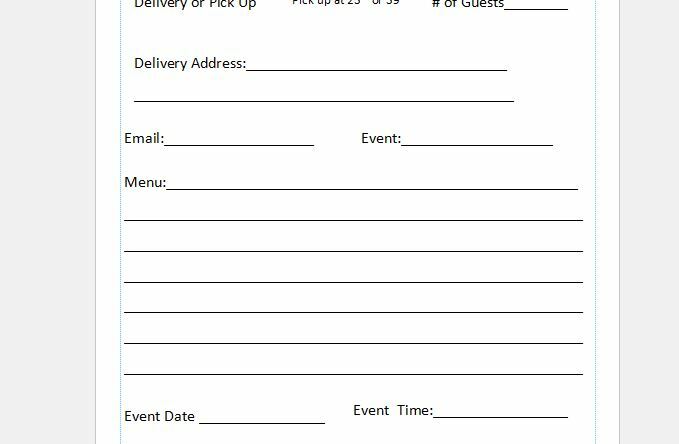 I hope you have found this example of a catering order form template useful. Feel free to download it and change it however you like. 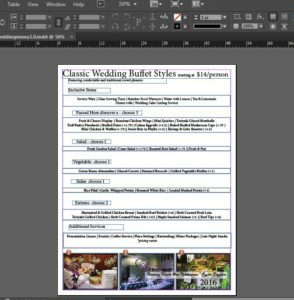 I used Microsoft Publisher to create this template, don’t worry if you don’t own the software they offer a 30 day free trial. It is a great software for designing other items like menus, flyers, postcards, etc. Let me know how it works for you or if you have any questions in the comments below! This catering order form is very helpful. It really is about being organized a professional. This form helps you to remember to get all of the important information you will need. Thank you. You’re welcome Wendy, glad you enjoyed this free template! 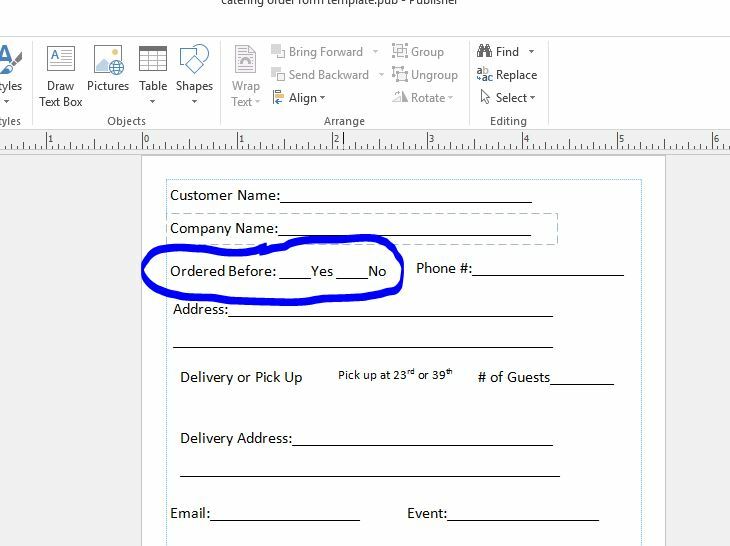 That is the great things about having an order form template like this Kenneth, it will decrease the amount of “hiccups” and possibly increase you wife’s sales as well if she uses the up selling technique I mentioned. Check back often as there will more templates to come. !